1. Jesús Sastre. 2. La Horra’s rolling slopes. 3. Racking in progress. 4. 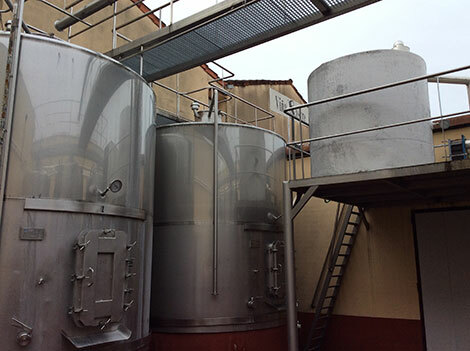 Fermentation tanks for Sastre’s premium reds. 5. Stabilization at naturally cool temperatures. 6. Some of Sastre’s wines. 7. White Flavus. Photo credits: Amaya Cervera. Located in Burgos, La Horra is one of Ribera del Duero’s most reputed villages, an example of the powerful, distinctively structured reds made in this appellation which stretches along the course of the river Duero in the provinces of Soria, Burgos, Segovia and Valladolid. The Sastre family has been growing vines in La Horra at least since their great-grandfather’s days. Grandfather Severiano was a founding member of the Asunción cooperative and his son Rafael set up the winery in 1992 with sons Pedro and Jesus –the first Viña Sastre’s vintage. After the tragic death of Pedro in a traffic accident in 2002, Jesús took over winegrowing and winemaking decisions. The family currently owns 47 hectares of vines in Roa and La Horra and purchase grapes from a few trusted purveyors based nearby. One of them comes from La Aguilera, a village where “wines are good and elegant, but less structured,” according to Jesús Sastre. Vineyards planted before 1960 are considered ‘old’ by the family. 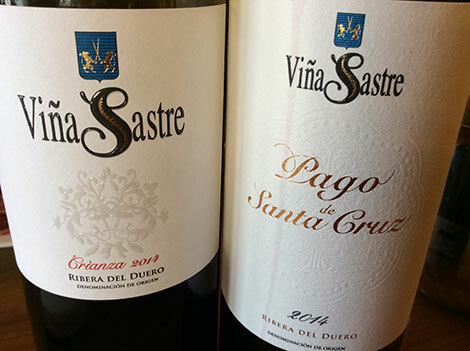 Their grapes go to Viña Sastre Crianza (14.5 €) and premium reds such as Pago de Santa Cruz (around 14,000 bottles, €38-40), Regina Vides (€70, 6,000 bottles) and Pesus (€275-350, only 2,000 bottles). The remaining ‘young’ vines are destined to Viña Sastre Roble (€9 in Spain). A man as corpulent as his own wines, Jesús Sastre ploughed many vineyards when he was young to earn some pocket money, so he knows La Horra like the back of his hand. He talks about the area’s silica and sandy soils, very easy to spot because pine trees are always planted on them, but also quite common in the lower part of vineyards where white grapes have been traditionally planted. There are also gentle, sand-resembling areas locally called dulcedales and gravely soils built on alluvial deposits. He dismisses flat lands unless they are on a plateau; from his point of view, the best locations for planting vines are clay-lime soils in high areas. “Not all old vines are good vines”, he adds. Soil and clones are important too. “In the old days, the vines’ winter wood used to be marked and then grafted on the field, so clonal diversity was preserved,” Jesús recalls. 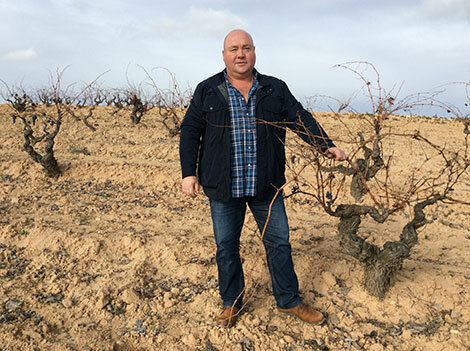 Many of his new 2010 plantings are 98 Tempranillo, a low-yielding clone with loose clusters and small berries but at least half of the new plantings came from cuttings sourced from his Regina Vides vineyards. 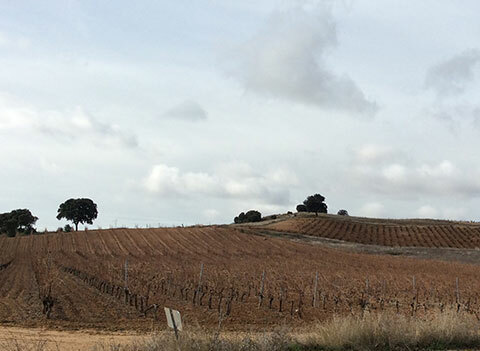 Old vines in Ribera are mainly found in villages where land consolidation didn’t take place. “In the 1950s and 1960s local grapes had almost no value. With land consolidation, farmers had access to larger growing extensions. They uprooted many old vineyards and planted grain, thus paving the way to the use of chemicals in their crops”, says Eugenio Bayón, managing director at Hnos. Sastre. Things dramatically changed in the late 1980s and 1990s after the region’s wines became popular. “Robert Parker was like God’s hand —he put Ribera on the map”, says Bayón. Back then, he recalls, a kilo of grapes was paid at 415 pesetas (the equivalent of €2.5) compared to an average price of €1.1 in the 2016 vintage or a maximum €2.4 for grapes of outstanding quality. The demand for Tempranillo cuttings soared and many plants where brought from Rioja and nurseries in France and Italy. In a very different context, La Horra implemented its own land consolidation between 2009 and 2010. With a natural instinct for finding good vines, Jesús seized the opportunity to get hold of good quality vineyards and uncultivated land with a view to plant in the future. “If you want to use natural yeasts, don’t kill them”, reckons Jesús. Contrary to what the house’s style may suggest, grapes are picked up relatively early. “Many winegrowers don’t throw bunches and use systemic treatments that halt the plant’s growth cycle. Copper has the same effect. We usually pick grapes 10 days before our neighbours. An early harvest has never been a bad harvest,” he concludes. Sastre’s premium reds come from selected plots located to the south of La Horra. Pesus is a blend of Tempranillo from two small plots plus a small addition of Cabernet and Merlot intended to add complexity. Regina Vides comes from three vineyards and Pago de Santa Cruz is a blend of five plots surrounding a small hill at 849m of altitude. Pesus’ and Regina Vides’ vineyards are located between the villages of Roa and La Horra in an area called Camino de los Frailes (Friars’ Path) which was the route taken by the monks of La Aguilera to reach Valladolid. Santa Cruz borders Condado de Haza, Alejandro Fernández’s wine estate in Burgos. The place is particularly blessed as it features all kinds of exposures. “Wine can be made here every vintage,” says Jesús. Furthermore, Santa Cruz was the family wine and the one shared with friends. This is the reason why it follows the traditional winemaking style in the area and is aged in new American oak, in contrast with the French oak used for Pesus and Regina Vides. Sastre had modest beginnings: four 20,000-litre stainless steel tanks which are still used for their Roble and Crianza reds. 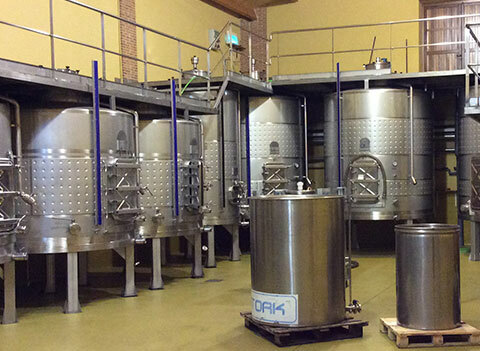 Premium wines are now fermented in a separate room with smaller, stainless steel vats making it easier to work top plots separately. 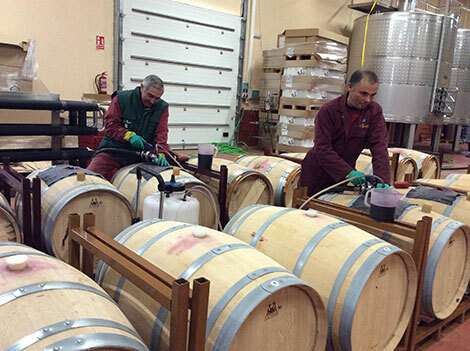 Malolactic fermentation also takes place in stainless steel vats except Pesus and Regina Vides which use oak barrels. A practical multipurpose room is used to cool down the grapes during harvest and to encourage malolactic fermentation later with the aid of a simple stove. Stabilization at low temperature happens in an outdoor courtyard –they just make the most of their cool winters. Sastre is not the type of sophisticated, technological producer you may expect in Ribera del Duero. They just rely on their old vines and a painstaking selection of grapes with the aid of vibrating tables that pick berries with the appropriate size. “The secret is that there’s no secret. Old vines naturally produce deep colours and structure and we use new oak to tame it”, says Eugenio Bayón. They are in the midst of selecting their own yeasts. “We’d rather have a safe net in case we are in trouble,” explains Jesús Sastre. The process is quite complex. From his point of view, the yeasts they get from their vineyards work better. “Even if there’s a prevailing yeast and another one completes fermentation, I think all of them have their part in the process”. No corrections are done in the wines either. “I sometimes tweak the acidity to favour extraction during fermentation but I don’t adjust pH levels,” he points out. Is Sastre worried by the current trend towards less structured, less powerful reds? “No, not at all”, Jesús answers confidently. “We are not trying to increase the power of our wines at all, which could be seen as an easy, obvious choice, but we aren’t bringing it down either”. At Sastre, he insists, concentration comes naturally from old vines. “We are not advocates of long fermentations or late devattings. The usual process is to cool down the grapes for about six days. When fermentation starts, we pump over generously and shortly but the frequency is progressively scaled back. It takes around eight to nine days to complete fermentation. And press wines are blended afterwards with their respective batches”. Contrary to what happens to other successful producers in the area which are focused on the domestic market, Sastre exports up to 40% of its wines. They clearly follow Ribera’s style: big, powerful reds with lots of fruit and new oak (barrels only see up to three wines), but they also have an extra freshness which makes such high levels of concentration palatable. Another distinctive feature is their gentle texture and enveloping palates. Jesús’ piece of advice to drink his wines is simple and straightforward: “Wines need as much time in bottle as in barrels to taste good”. I would add that high quality Riberas generously aged in new oak eventually lose the excess of wood, so consumers who dislike this feature should give the wines some extra cellaring. 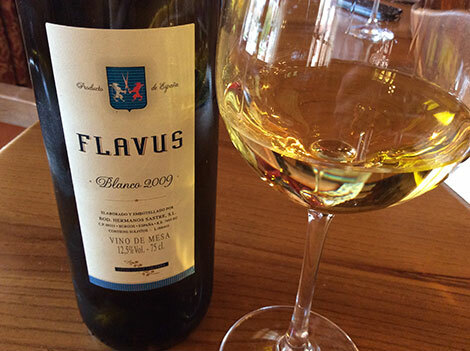 Adventurous wine lovers who may dislike powerful reds but are fond of rich whites, should try and get hold of a few bottles of Sastre’s rare white Flavus and lay them down. The 2009 vintage I had the chance to taste during my visit was opulent and complex, showing well-defined candied fruit and great consistency. This wine is really hard to make as all the isolated white vines need to be harvested separately, which are usually found in soils with sand content. This wine is not made from Albillo but Jaén (aka Pirulés) which could either be Palomino or, as wine expert Félix Cabello points out, the same Cayetana Blanca planted in Extremadura which is called Calagraño in Rioja. Yet the most important thing is neither this wine, nor the others made at Sastre would be possible without the great respect this family has shown for their vine heritage. 2004. “Outrageously ripe”. Reds had low pH and very high alcohol levels, up to 16%”. 2005. “Fantastic vintage, one of the best in the past 15 years with balanced alcohol levels”. 2006. “A good, abundant vintage, yet fine and balanced. Relatively early expression but it is coming along well”. 2007. “Awful. We suffered hail and then frosts in September. Out of our top reds we only produced Pesus, which didn’t reach 14.5% of alcohol. Production was very low”. 2008. “A very cool vintage, grapes hardly ripened and botrytis was an issue”. No premium reds were made. Their grapes were destined to the Crianza and those usually used for the Crianza went to the entry-level Roble. 2009. “Acidity was a bit low, but it was a remarkable vintage”. 2010. “Cool, high-acidity vintage but with no botrytis at all. Very good”. 2011. “A really great vintage and the very best since 2005”. 2012. “A balanced vintage but it didn’t reach the level of the more powerful 2011. Wines were really easy to make and I find our Crianza outstanding”. 2013. “Very much in line with 2008, perhaps worse”. 2014. “Mind-blowingly good; all the grapes were fine and we had quantity as well; it could be as remarkable as 2005 and 2011”. 2015. “Another good, easy vintage for us, perhaps more tannic and less abundant than 2014, but the quality is high”. 2016. “Similar to 2015 and to 2006; the wines show good balance”. An extra tip: “Vintages finished in ‘7’ have a poor reputation in the area: 1967, 1977 and 1987 were very bad: 1997 was even worse; 2007 was terrible”. Could 2017 break the trend?